The Kowa TSN-EX16S increases the magnification of the current Kowa System S spotting scopes by 1.6x when combined with the original eye-piece. Kowa optical technology and superior lens coatings deliver superb optical performance. Perfect for long range observation and digiscoping for both terrestrial and astronomical subjects. The high quality engineered TSN-EX16S is easily mounted on the accessory thread of compatiable Kowa System S scopes between scope body & eyepiece. The styling perfectly complements the spotting scope body. 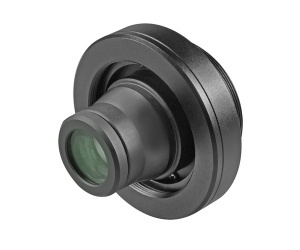 The TSN-EX16S features a bayonet mount for Kowa compatible eyepieces. (see opposite).The TSN-EX16S can be used on both angled and straight spotting scopes. The TSN-EX16S 1.6x Extender is fully compatible with a range of Kowa digiscoping adapters. Incredible telephoto power far beyond any conventional photography system and much more compact. Please note: Some TSN-1/2/3/4 models have protection glass inside the body. These models are not compatible with the TSN-EX16S.